Strategy and Tactics: Dark Ages by Herosoft is the latest iteration of a risk-style board game that is enhanced by persistent upgrades to generals and leaders and a large variety of different troop types and formation options. In the end however, the bigger army wins, and getting the bigger army in this turn based game is disappointingly trivial. If you are familiar with Herosoft’s other titles, you’d probably be thrilled to see another entry in this style, this time with real-time movement — which is probably the biggest change compared to the Strategy & Tactics: Wargame Collection. If you are not familiar with the predecessor, please be warned right away, this game is exactly what the title says: a strategy game, i.e., you move armies across a map in order to complete objectives. And it’s also a tactics game, meaning that you select one of nine battle formations, positioning different troops in various tactical, advantageous formations. Other than moving and selecting the formation, however, you are basically waiting and recruiting. And that’s it. On the strategy side, each army is tied to a general, and you are limited to a maximum of six generals. On this layer, your input as a player revolves around making decisions about troop composition, troop coordination, and the selection of targets and objectives for each army. This sounds great in theory, but the actual reality of gameplay is much more bland. Armies move one tile per turn. There is no movement queue, so if you want to move one army to a province that is twenty tiles away, you are clicking forty times. If you were to move all six of your armies, that would be two-hundred-forty clicks: one-hundred-twenty left clicks, one-hundred-twenty right clicks. Yep, it’s really that simple. Compiling a list of features that are missing in comparison to other war (or hex-based) games, like Panzer General, would take a very long time, so it’s probably best to say that Strategy and Tactics: Dark Ages takes a more casual approach. Although defeating armies on the battlefield is mean business, casually dispatching every resistance feels surprisingly meaningless. If f(x) = victory, then x is not your input or your decision making, rather, it’s mainly based on the number of times you have clicked on the "end turn" button. In proper English, this means that the casual meaninglessness eventually boils down to a perfunctory title with rather serious balancing issues. If you’re a gamer that’s not easily tilted, you might be able to soldier on and shoot for the various troop upgrades and unique generals showcased here. This is done by completing the various objectives of each scenario, some of which unfold across multiple stages. Thankfully, these scenarios can be — or rather, need to be — replayed, in order to complete more bonus objectives and/or farm "fame," which is useful for unlocking upgrades and generals. The troop upgrades however simply increase the general effectiveness of your troops; they don’t dramatically alter your general approach with a certain troop type. 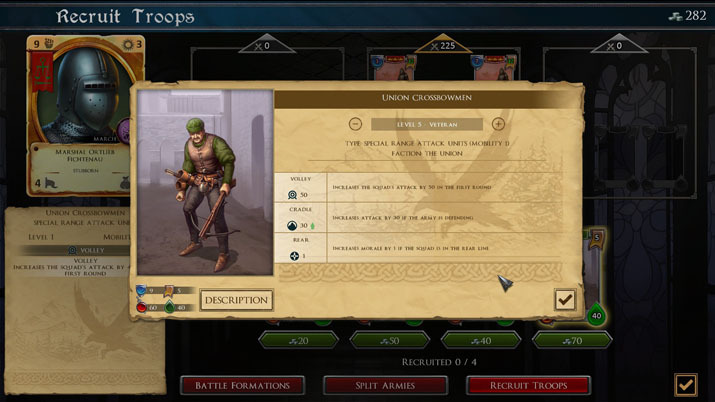 Although troops have certain special abilities, the upgrades only influence your army composition (cavalry vs light infantry vs heavy infantry vs archers), not the actual role or usage of those troops. The general presentation and introduction, which is serviceable, is probably the biggest strength of the title. The overland map is well done, the army models and map models look interesting enough, and every troop or general has a bit of flavor text describing the world and its setting in more detail. Although these snippets of information did not answer any questions I might have had prompting me to read them in the first place (why did I do that?! ), they didn’t raise any questions either, which was comforting, considering how questionable the rest of the game had appeared. 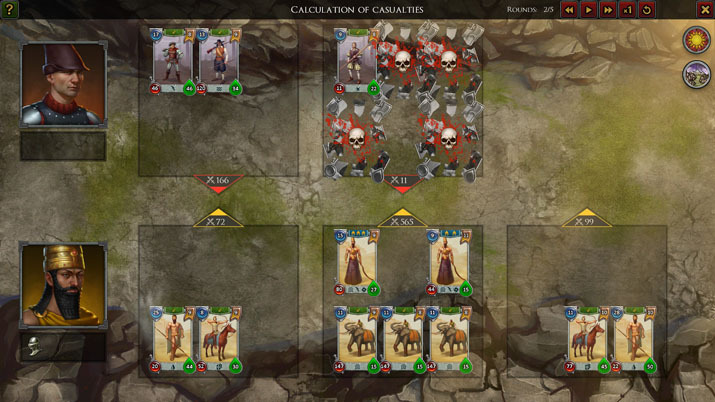 Strategy and Tactics: Dark Ages is a perfect game for desperate times. Imagine the year is 1999, you are ten years old, and locked into a train with fourteen days until you arrive at your destination. You have a laptop that was built before the Great Invasions by Strategy First the invention of the dedicated graphics card. It’s dark and there’s no one in your compartment to appreciate your sunglasses. So you start up the game, you learn everything about every single troop type, you replay the scenarios, completing every single objective, leveling up your generals and troops in the process. After two weeks, you will know the optimal battle plan for each of the scenarios. You will be able to counter the computer armies with maximum effectiveness. And then, when you get off the train, you travel to the year 2017 and play every iteration of the Total War series on auto-resolve only. And you sigh. Because Strategy and Tactics: The Dark Ages was the game of your youth. Volker has been playing board, card, tabletop, role playing and strategy games since the neolithic age, and is currently emphatically hitting the space bar after coming to a full stop. In games, he is looking for a VR experience without the headset, hopefully propelling his time machine to the next level. When not playing with words, swords, or Drows, he is working as a translator and vagrant wine promoter. Cheers!